Hadji Sadık Bey (our grandfather) came from Prizren, Albania to Istanbul in 1870. During those years, he saw that around 200 shopkeepers of the townspeople produced and sold boza as a dark-coloured, sour-tasted, juicy-thick beverage. He experimented with a different technique in that period; and today’s thick, straw-coloured slightly-sour flavour, which is given at the moment when fermentation bubbles are newly formed, became the first signature of the brand. He promoted the boza, which he produced through his own means in the cellar of his house, by circulating it in copper billycans that he carried on his shoulders around the Palace and its surroundings at winter nights for six years. Being impatiently waited for at each corner, Hadji Sadık Bey took heart with the increasing demand. 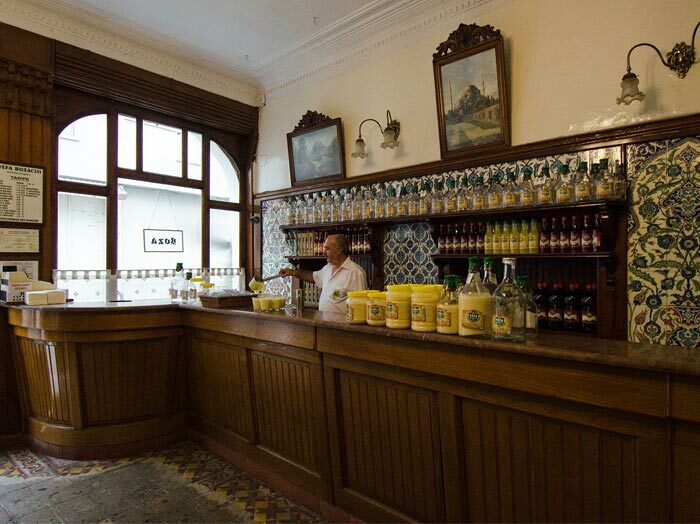 He opened the first official business of boza product in September 1876 in Vefa, one of the most distinguished neighbourhoods in Istanbul where dynasties, aristocrat families and bureaucrats of the era resided. The boza shop that was opened in Vefa was named “Vefa Bozacısı” (Vefa Boza Shop), and this ancestral beverage was both standardised and made into a profession, maintaining its continuity for generations. Hadji Sadık Bey produced this special, sought-after Turkish beverage himself for many years in order to maintain its thickness and flavour. Taking along his son, Ismail Hakkı Vefa into business in the later years, Hadji Sadık Bey continued production in Vefa Bozacısı together with his son. Started by Hadji Sadık Bey and maintained by family members of the 4th generation today, boza production is continued according to Turkish standards by preserving the traditional palatal delight.